There are 2 ferry routes operating between Sicily and Ustica Island offering you combined total of 36 sailings per week. Liberty Lines Fast Ferries operates 2 routes, Palermo to Ustica runs 5 times per day & Trapani to Ustica about 1 time weekly. As the frequency and duration of crossings on some routes varies we would advise that you do a live search for crossings from Sicily to Ustica Island to get the most up to date information. Ustica is a small Italian island within the volcanic Aeolian chain in the Tyrrhenian Sea, to the north of Palermo, Sicily. Accented with bright pink hibiscus and green cacti, Ustica is a small, dark drop in the ocean, known affectionately as ‘the black pearl’. With a jagged coastline jewelled with sparkling grottoes, the surrounding waters are protected by marine area status, home to around half the Med’s fish and coral species. 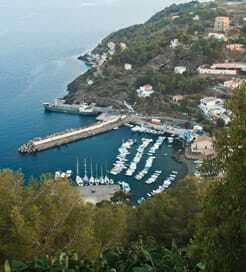 Italians frequent Ustica from July to August, so it’s best to sail here in the shoulder months, when the boat trips, enigmatic Roman ruins, picturesque piazzas and coastal footpaths are far less busy. 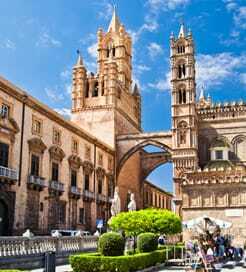 Given the island’s popularity for short-excursions and weekend breaks, it is well linked with big Italian cities by ferry, including Palermo and Napoli, with regular routes to its port on the east coast.